Control your home right from your smartphone or tablet. Cutting edge home automation technology allows you to control your home’s entertainment system, adjust the thermostat, control door locks, monitor security and much more! Make your home smarter than ever with cutting edge home automation technology. Did you remember to lock your door? Did you forget to turn the temperature up before you left for work? Away on vacation and you forgot to leave a light on? Want to control your home’s audio system from the couch? Control your home from your smartphone, anywhere at any time. Home automation can save you time, money, and stress. Save energy and stay comfortable without compromise. 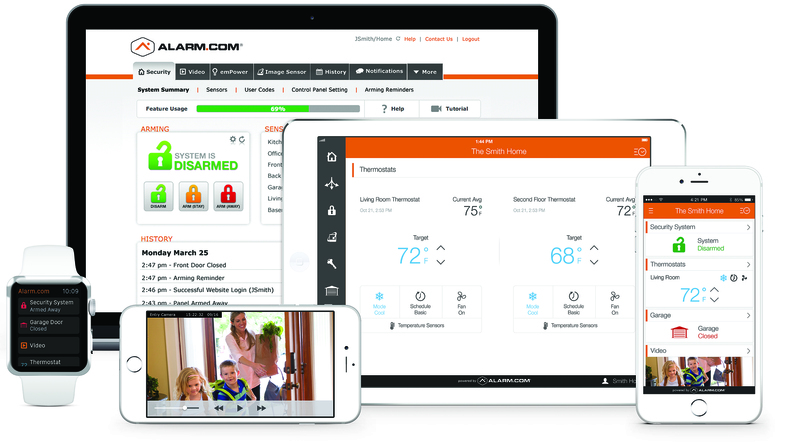 Our Energy Management Solution connects all your devices into a responsive system that helps you save automatically. Control your smart thermostats, lights, and sensors in a single app, and get instant alerts when the temperature changes. Get truly smarter savings with an Energy Management Solution that combines easy to use automation, location-based optimization, intelligent learning, and triggered automation. The Smart Thermostat allows you to set location-based rules using Geo-Services. Your thermostat can dial down to an energy-saving temperature when you leave and begin re-adjusting to the perfect temperature when it senses that you’re on the way home. Home automation is perfect for people with multiple properties. You can’t be everywhere at once. If you have multiple short-term or long-term rental units, having the ability to lock and unlock doors and control systems with in the home is an invaluable timesaver. Keep an eye on your vacation home year round and be confident in the status and safety of your property. With home automation, your home’s entertainment system will never be the same. Control volume, switch tracks, and play music through your whole house from your smartphone. We have multiple options for speakers and audio systems that will enhance your home to new levels. Give Strada Security a call today at 877-906-7772 and learn how much our automation packages can change your home and simplify your life.